Countless Facebook posts, Tweets and comments have bemoaned the "scab" NFL referees who have taken over for the regular refs who have stopped working amidst a labor dispute. The new refs have blown calls, unnecessarily prolonged games and even cost some teams a win depending upon who you ask. Today, the regular referees settled on an agreement with the NFL that boosts their salaries and benefits (they will now make $173,000 annual salaries in 2013). Everybody seems pretty happy, especially fed up fans. Meanwhile, the massive teachers' strike in Chicago ended recently, and another strike among hundreds of Canadian nuclear scientists ended earlier this month. 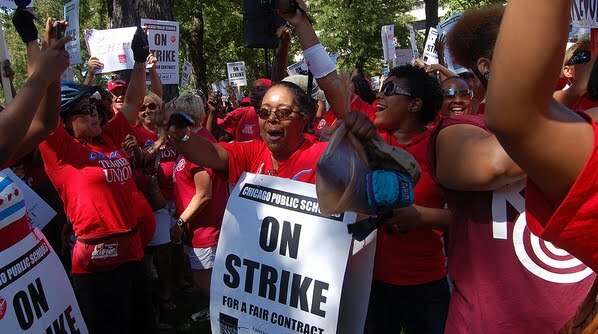 Strikes this big among teachers and scientists are quite rare. With all three of these two strikes and referee lockout resolved, let's take a glance at the final deals and reactions individually. Together, these labor disputes may reveal a little bit about our society's general view of these varied careers. Image courtesy peoplesworld via flickr. Raises: Average salary raise from $149,000 in 2011 to $173,000 in 2013 — a 16 percent increase over two years. Benefits: Defined benefit retirement plan maintained through 2016. On average, the NFL will contribute over $18,000 in retirement benefits per official. Raises: 2-3 percent raises over the next few years. Job Security: More laid off teachers will be hired when job opportunities arise in the district. More subtle categorizations of teachers' performance will lead to fewer teachers being lumped into a pool that could be potentially laid off. Freedom: Teachers now have more freedom to create their own lesson plans. Note: This strike consisted of scientists, technicians and engineers working on nuclear power for Candu Energy in Canada. Raises 2-2.5 percent raises over the next few years. An average of 3.6 percent increases when also accounting for merit increases. New Protections: New protections to "protect members from potential abuses of seniority at individual sites," according to the Huffington Post. Of course, these are three very different labor disputes with their own complexities. Nonetheless, a rough comparison reveals a few interesting points. Strictly financially, the refs are the clear winners among this group. With an average 16 percent raise over two years, they blew the roughly 3-4 percent wage increases for teachers and scientists out of the water. But financial benefits weren't the sole motivation for the teachers' and scientists' strikes. In particular, the teachers were also concerned with job security -- something the referees didn't seem as concerned with during their talks with the NFL. Also, the Post-Tribune article referenced above mentioned that many teachers were very excited to hear about new freedom to tailor lesson plans to their classrooms. Meanwhile, the scientists negotiated not only wage increases but also on-the-job protections from seniority, and this may fall under the broader category of job security. On average, nuclear technicians in the United States make about $68,000, according to the Bureau of Labor Statistics. Nuclear engineers make about $105,000 annually, and physicists working on research and development made about the same. Scientists, teachers and referees make significantly different amounts of money. Among these three labor disputes, the referees appeared to win the most noticeable concessions, but all three groups were going after different improvements. Although these three groups make significantly different amounts of money, our economy isn't a perfect meritocracy. Sacrifices in pay are worth the more intangible benefits of a teaching or research career. Nonetheless, these three labor disputes provide interesting case studies in a short time period. I'm curious to see how this strike of nuclear scientists may play a role -- if any -- on the unionization of graduate students in the sciences. See this Chronicle of Higher Education article for more background on that topic. Had an awesome read.I prefer to read this kind of posts.Keep stuff like this coming. Don't forget knowledge is more important please.